Finding the right bullet journal supplies can be overwhelming. There are so many options! Though I think it’s always smart to start simple and build up as you need it, after bullet journaling for over 3 years I have gathered quite the collection. Here are the best I’ve used so far and why I use them. But I’m also of the opinion that a little treat — a little something special — keeps the motivation flowing. You won’t avoid your planning routine when you’ve got a shiny new fountain pen begging to be used. You get a cool new gym bag when you finally commit to that gym membership, right? Just me? Well, anyway, I’m of the school of thought that says “Be nice to yourself, and yourself will be nice to you.” You won’t find tough love from me. So, here we go: the best supplies to rock a Bullet Journal in 2019! Note: This post contains affiliate links. You never pay more, but I may receive a small commision that supports this site and all the free content you love. I never recommend a product unless I have used it myself and loved it. As far as bullet journal supplies go, you can’t get any more essential than a great dotted journal notebook! There are so many and, after going through a dozen that fell apart — ink bleeding through the paper, etc. — these are my favorites. This is a popular one in the Bullet Journal community and for good reason. The Leuchtturm1917 is sturdily built with high-quality paper and it’s optimized for organization. For instance, it comes with pre-numbered pages and an index, making it ridiculously easy for you to keep track of where you sketched out that random idea, or where you wrote the address of the party you’re late for. It has a hardcover and that’s a requirement in my book. My bujo travels in my purse with me almost everywhere I go, and without the hardcover, it would surely be in tatters by now. It has two bookmarks which allow me to keep track of my current day AND a collection of long-term lists/plans. This notebook really lives up to the hype. I like it so much in fact, that I frequently give them away to future Leuchtturm enthusiasts. If you want to know what I really think of this wonderful piece of kit, take a look at my full review. For more details and how it measures up to the Scribbles that Matter notebook, take a look at my comparison post. If this sounds like the journal for you, you can pick up the Leuchtturm1917 dotted notebook. Alternatively, if you’re just starting out and want something more specific to Bullet Journaling, pick up a special edition. I currently use a Rhodia Rhodiarama (in purple) as my Morning Pages journal. If you’re unfamiliar with Morning Pages, I highly recommend the book The Artist’s Way, and it’s updated companion The Morning Pages. The Rhodiarama is a soft cover notebook with a nice leathery texture and an elastic closure. It has one bookmark and a sturdy pocket on the back cover for whatever you might want to carry with your notebook. The paper quality is actually significantly better than the Leuchtturm! It’s thick and silky and your pen glides over it like a dream. The only thing holding me back from making it my official Bullet Journal is the soft cover. My bujo gets used A LOT, and I feel the hardcover is very necessary. I go into the pros and cons of the Rhodiarama in this review. A flexible cover? And some of the finest writing paper in the world? This might be the Bullet Journal notebook for you. If you’re not soaking your pages in ink or paint and love the smooth feeling of a nib on a silky surface, the Rhodiarama is your journaling notebook. Scribbles That Matter is a great option for beginners! The covers are a plush leatherette that feels great in the hand. It even comes with a pen loop! It also comes with a pre-printed Index and Key page and has a pen test page in the back. The paper is 100gsm and never bleeds thru. I’ve even used watercolors on it with no issues! I go more into depth on this great Bullet Journal Notebook in a short review. If you’d like to know more about this notebook and how it compares to the Leuchtturm as a Bullet Journal, take a look at my comparison post. It comes in a variety of colors and the iconic cover comes with free doodle inspiration! If you prefer a cleaner look to your notebooks, you can also get the Pro Version. It comes with all the same great features minus the doodles on the cover. Do you like the embossed cover and the thick, smooth pages? Then this is the notebook for you. Take your pick between the iconic one with the embossed cover or the more elegant pro version. 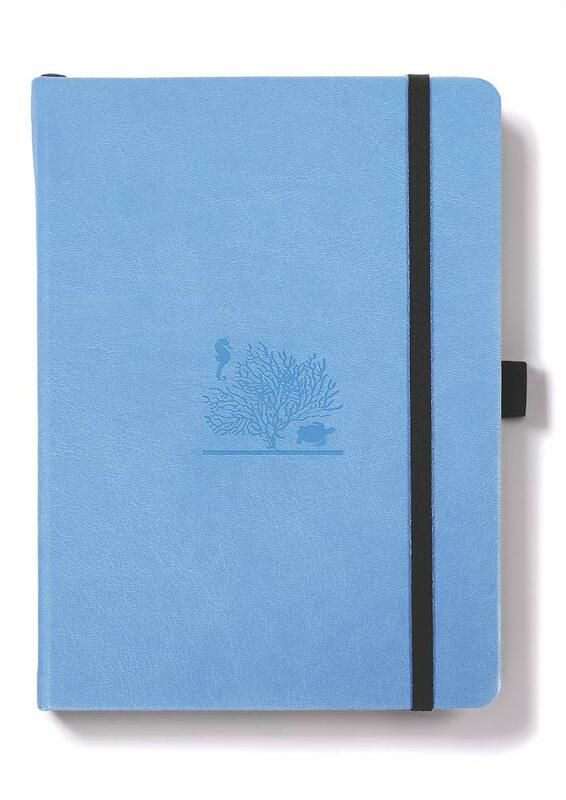 Dingbats is a 100% vegan company that makes some of the best notebooks on the market. They use a special coating on their paper that makes it absolutely bleed proof. These notebooks also come equipped with a tab system built into each page so keeping track of info is incredibly easy. They come in a variety of colors and every notebook has a different animal embossed on the front! If you want to learn more about these fantastic notebooks, check out my in-depth review of their brand new Earth Collection! Do you want a notebook as vegan as you are? Or, are you tired of seeing what you wrote on the other side of the page bleeding through and ruining two pages? Then give Dingbats Earth Collection Dot Grid Notebooks a try. Pad and Quill just launched their first line of luxury dot-grid notebooks and it’s fantastic. The hardcover is wrapped in a cool grey linen fabric that makes this a very elegant option for beginners. One of the best things about ordering from Pad and Quill is that they offer custom leather covers for their journals. You can even get your initials embossed on the leather! For all the specs and a detailed review check out my in-depth review. The linen cover, the writer’s paper, the attention to detail — Pad & Quill really knocked this one out of the park. If you pick this one up, you won’t be disappointed. If you are starting your very first journal and feel overwhelmed by the options, ThoughtSpace Journals is a fantastic place to start. These notebooks come with a leatherette hardcover in 2 design choices – black or white with gold foil dots. I love the simple elegance of the covers. They come with all the basics you need to start bullet journaling including an index, 2 bookmarks and a pocket in the back. They come with 100gsm paper which means it will stand up to heavy duty markers and pens with minimal bleed thru. ThoughtSpace Journals even holds up to watercolors! But the best part about these notebooks is the price! At 14.99 each, you are getting all the specs of a premium notebook for way less! So if you’re looking for a premium notebook on a budget, ThoughtSpace Journals is a great option! This baby is the fountain pen for people who don’t like fountain pens. The Pilot Metropolitan is light and easy, not terribly expensive, and comes in a large variety of colors and designs. You get the satisfying ink flow of a fountain pen, without the mess that can sometimes accompany it. Personally, I’m still a fountain pen newbie, and though I’d love to wield one of those crystalline dip pens like a wizard in my high tower, I’m going to need to work up to that. And so will my wallet. This pen takes the intimidation out of fountain pen joy, and I highly recommend it for beginners. It also comes in a variety of stylish designs! The Lamy is another high-quality fountain pen that is very user-friendly. It has a heavier ink flow than the Pilot Met., and while that’s a selling point in some ways, I find I make mistakes more frequently when they are the hardest to cover. I like to use this pen for my Morning Pages because the heavier flow of ink encourages me to keep writing at a steady pace. I’m also less concerned with mistakes, because the goal of the Morning Pages is getting the thoughts out, and it doesn’t have to pretty. In fact, it’s better if it’s not. I have both the Lamy AL-Star and the Lamy Safari. The Lamy AL-Star has a smooth metal body and a bit of weight to it, which feels wonderful in the hand and makes what I’m writing seem extra important. The Lamy Safari has a plastic body, slightly rough texture and is very lightweight. This is great for hauling around in your bag since it can take a beating and travels well (hence the name). Both make it extremely easy to replace the ink — no youtube videos required. All and all, a fantastic pen. I’m in love with these pens. Staedtlers come in beautiful, brilliant colors and a .03 fine tip, enabling lots of detail (and teeny tiny doodling). They come in wonderful color sets, and the packaging is smart and functional. Flip it open and you have your own personal pen stand. Once I got myself addicted to the 10-pack and craving new colors, I got the 36-pack of every color they make (including neons). Amazon runs great deals on these bigger packs, making each pen that much more affordable. Sadly, the big packs don’t come with a mega container/stand. They do sell sets that come with their own roll-up pen case, and in hindsight, I wish I had purchased one of those first. Top of my wish list now! Till then, I carry all my pens around with me in a purple bag. Like a bag lady. I’ve only recently begun trying my hand at calligraphy, but I can see addiction on the horizon. The Tombow Brush Pens are an industry standard and perfect for beginner calligraphy. There is a fine tip for precision on one end and a brush nib of the same color on the other side. This is great for adding a little flair to your lists and musing with twirly letters and colored ribbons. I currently own the muted pack, but I’ve got the portrait pack on my wish list. The Tombow Fudenosuke is one my favorite pens of all time! This is the pen that I use to make fancy headers in my Bullet Journal. This pen is super easy to use even for a stone cold beginner! It truly makes hand lettering so much easier! They are also super affordable! You can pick up a 2 pack from Amazon for under $5! And now for 2019, they come in a variety of colors! Pentel Sign Touch pens are very similar to the Fudenosuke and are even easier to use! They come in a variety of line widths so you can write fine or thick. And their color selection is fantastic! For more pen recommendations check out 8 pens for your Bullet Journal! Washi tape is not too sticky, so you can move it around easily. It’s okay for light repairs but it’s mostly for decoration. It comes in hundreds and hundreds of different designs and patterns so you can customize your pages to your heart’s content. If you’re not much of an artist, but still want to add some fun personality to your notebooks, this is definitely the way to go! You can usually find plenty of varieties at your local craft store, and you can also order packs of it the here. The Helix Angle and Circle maker makes drawing out the habit tracker and level ten life spreads super easy! Of course, you’re already equipped with the best bullet journal supplies — your brain and your own two hands. You don’t need a stack of bullet journal supplies to be productive, but I must say: they do help. A great tool that’s a pleasure to use keeps me motivated day after day to keep recording my life, keep writing, and keep growing. So, though I don’t think you need to be a fancy pants to keep a bullet journal, I do think rewarding yourself with beautiful things keeps the soul ready to work. From time to time, I run giveaways of the best supplies. If you’re interested in knowing when and automatically entering the contests, sign up here. What are your favorite bullet journal supplies? Let me know in the comments! I’ve heard so much about Rhodia notebooks but I’ve been hesitant for the same reasons you are – I pretty much need a hardcover and I keep hoping they’ll put out more colors. Guess we’ll have to keep our fingers crossed! Maybe if we all talk about it enough, Rhodia will cave in :). Their paper really is great, I’d buy a colorful hardcover in a second! I would love some suggestions for a 12 yr old girl. She has asked for a bullet journal and supplies for Christmas and her bday which is dec 20th. I am so clueless!!! Micheals also sells some great dot grid notebooks for a very low price! Hello, I have to disagree about the Leuchtturm 1917 journals. I bought one based on the reviews such as yours. Every single pen and pencil I owned ghosted through so bad I could read the other page. The print of the Bullet Journal instructions in the Bullet Journal version I bought was so ghosting that I could read the words on the other side. Right now it’s just a glue/tape in printable pages such as yours in it.